The Teen Diva declared her new found passion and must do summer adventure. She wants to take riding lessons. Although we are, without a doubt, city folks, my children have enjoyed exposure to benefits of both city and country living throughout their lives. My parents retired from the 'burbs to the country and their new extensive property has provided hours of exploration and adventure as my children and their cousins explored the woods and creek, not to mention salamander hunting, Gator rides, bon fires and even a bit of an education in chicken farming. Although my parent's new property came equipped with a weatherized stable, as opposed to hosting a fun animal, such as a horse or llama, my father decided to try his hand at semi free range chicken farming. Odd Chicken Fact: Chicken love to eat tomatoes! Just a few miles away, my children have always enjoyed visiting with my sister and their cousins because her husband's family runs a centennial farm. With enormous, shiny farm equipment to admire and stock representing all manner of traditional farm beasts, including cow and pig, my children have delighted in exploring the farm for years. Always welcoming, my in-laws have welcomed my children to participate in their 4-H club events and we never miss attending the country fair with them. 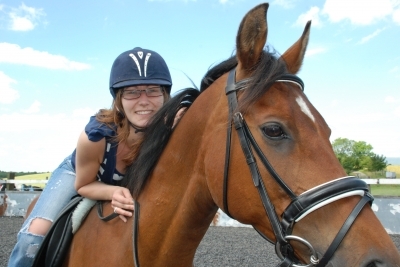 Adjacent to the centennial farm is a riding stable that has caught the Teen Diva's attention for years. Although we've discussed the possibility of riding lessons in the past, her typically busy sports schedule throughout the year has put this potential passion fairly low on our family's list of priorities. Simply finding time to make the 30 minute trek has been prohibitive. However, this summer, with some much needed free time and the benefit of a driver's licence, the Diva is determined. Of course, the fact that one of her new BFFs is a rider likely serves to fuel her new passion. Although the price involved her allowing her riding lessons will take a significant bite out of our budget, I'm inclined to indulge her. All too soon she'll be off to college and this Mom wants to encourage her to enjoy fun activities during her momentary reprieve from her typically grueling schedule. True to her Diva nature, I have no doubt she'll insist upon having a full riding habit, from head to foot to look the part. Although our friendship with the folks at the riding stable might allow for a modest discount, the only way I'll be able to accommodate the Diva's new found passion is to save on riding gear. I'm certain we'll have some fun searching for a fun riding outfit online and what a great outfit to have available for her upcoming Senior portrait shoot! I did find a great deal on Chaps from Equestrian Clearance but we're on hold until the Diva decides if she wants to go with a Western or English riding look. What fun new adventures are in store for your kids this summer? Have you even taken riding lessons? Any tips for the Diva? Please find my disclosure policy. Horse Image. My brother in law and sister in law own a horse farm. My best tip is don't stand too close to the grouchy horses. They bite! wow! That does sound like an expensive hobby to take up. My kids got to ride a horse for the first time at a renaissance festival and they loved it! i rode for years in highschool! Go with English...western is like putting a sack of potatoes on the back of the horse. English has much more finesse. I miss my chaps and gear! My grandfather owned quarter horses and I use to love to ride. It is a great way for children to develop a team work attitude as horses are great in teaching this lesson. Nurturing and the discipline of taking care of an animals needs are also great character builders that horses teach. Good luck to her in this new venture. Interesting post. Riding horses is so foreign of a concept to me. lol.